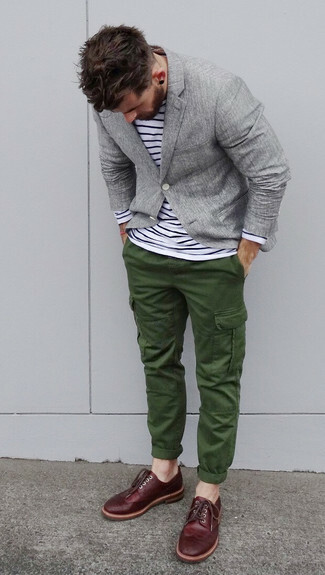 A Zanerobe channel box long sleeve t shirt from Nordstrom and dark green cargo pants will convey a carefree easy vibe. You could perhaps get a little creative when it comes to footwear and spruce up your look with burgundy leather brogues. If you're on the hunt for a casual yet on-trend getup, try pairing a Zanerobe channel box long sleeve t shirt from Nordstrom with brown chinos. Both pieces are totally comfortable and will look great paired together. 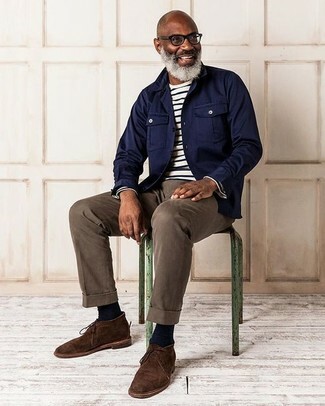 And if you want to instantly kick up the style of your look with one piece, add dark brown suede desert boots to the mix. 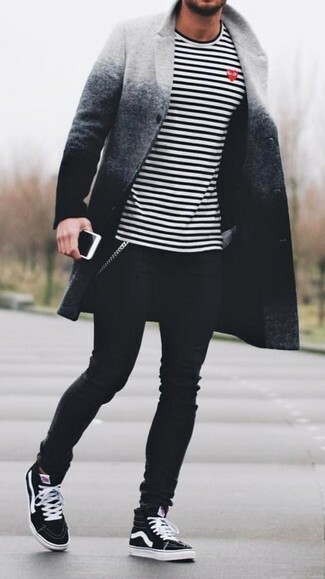 If you're a fan of functionality dressing when it comes to your personal style, you'll love this simple pairing of a white and black horizontal striped long sleeve t-shirt and black skinny jeans. And it's a wonder what a pair of grey low top sneakers can do for the look. If you're in search of a casual yet seriously stylish getup, marry a Zanerobe channel box long sleeve t shirt with khaki chinos. Both items are totally comfortable and will look great paired together. 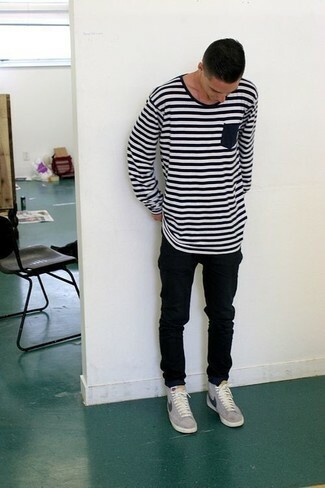 Complement this outfit with white low top sneakers. If you're all about comfort dressing when it comes to fashion, you'll love this knockout pairing of a Zanerobe channel box long sleeve t shirt from Nordstrom and blue ripped skinny jeans. You could perhaps get a little creative when it comes to footwear and lift up your outfit with pink high top sneakers. Try teaming a Zanerobe channel box long sleeve t shirt with blue jeans if you're after an outfit idea for when you want to look casually cool. 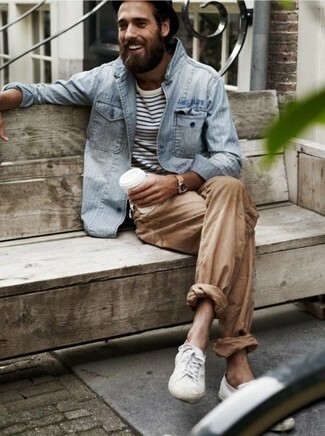 To add more class to your look, complement with olive canvas desert boots. If you're all about comfort dressing when it comes to your personal style, you'll love this easy pairing of a white and black horizontal striped long sleeve t-shirt and mustard shorts. Up the cool of your getup by complementing it with brown leather boat shoes. 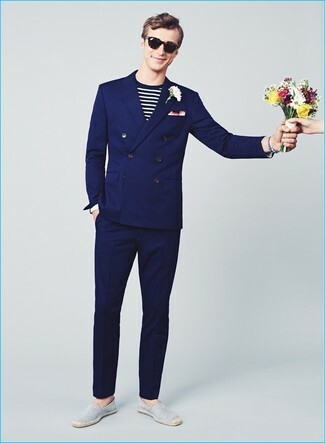 This combination of a Zanerobe channel box long sleeve t shirt from Nordstrom and a navy suit is super easy to put together in no time, helping you look awesome and ready for anything without spending too much time digging through your closet. To bring out the fun side of you, complement your ensemble with grey horizontal striped canvas espadrilles. 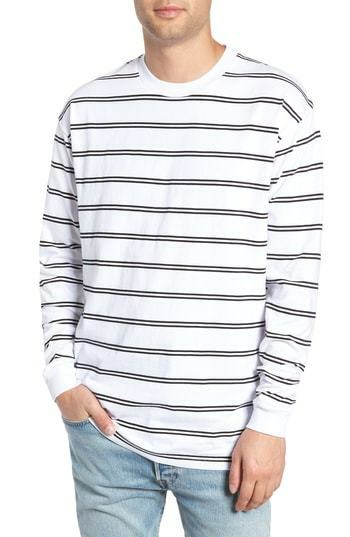 If you prefer relaxed dressing when it comes to your personal style, you'll love this on-trend combo of a white and black horizontal striped long sleeve t-shirt and black skinny jeans. 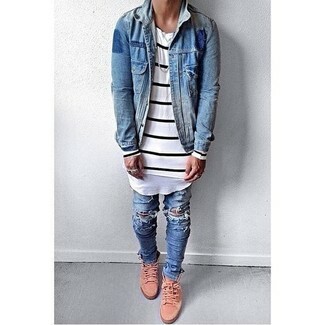 When it comes to footwear, this look is complemented nicely with black high top sneakers.